Central Kansas Community Foundation recently received accreditation with the nation’s highest standard for philanthropic excellence. National Standards for U.S. Community Foundations® establish legal, ethical, effective practices for community foundations everywhere. The National Standards for U.S. Community Foundations® program requires community foundations to document their policies for donor services, investments, grantmaking and administration. With over 500 community foundations already accredited nationwide, the program is designed to provide quality assurance to donors, as well as to their legal and financial advisors. Central Kansas Community Foundation works to meet critical community needs and support local causes, including supporting the arts, cultivating gardens, expanding literacy and feeding children. Central Kansas Community Foundation offers a range of charitable funds, allowing donors to advance a cause, support an individual organization, provide flexible support for community needs or recommend individual grants. 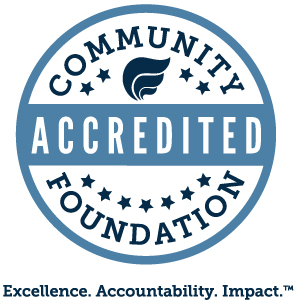 In addition to affirming the organization’s philanthropic services, the accreditation validates Central Kansas Community Foundation’s grantmaking practices for the nonprofit community. Through philanthropic services, strategic investments and community leadership, Central Kansas Community Foundation helps people support the causes they care about, now and for generations to come.